Your Android gets stuck in black screen and the touch screen cannot perform normally? You might want to connect your mobile phone to computer with a USB cable to check and extract the contacts and text messages from your Android phone, unluckily, it needs to enable USB debugging on your Android phone. So is there any way to recover SMS from Android phone like Samsung, Huawei, LG, HTC, Sony, Motorola, ZTE, OPPO and etc. The answer is yes, please keep on reading. 1. Android phone runs out of memory. When the phone is running too many programs at the same time, the phone might be run too slowly, which may make Android phone dead and turn black. To fix it, please force reboot your Android phone. To do so, please press and hold the Power button for at lease 10 seconds till the screen turns off, and release it. 2. Root Android in an improper way. The Android with black screen can be caused by unsupported firmware upgrade system or incomplete flash process due to abnormal reasons. To fix it, you can root your Android phone again with the old version of firmware. 3. Apps crash on Android phone. The applications installed on Android conflict with each other. To fix it, you need to uninstall the incompatible apps from your Android phone. 4. Android battery failure. Android's black screen issue can be caused by aging of battery, which makes under voltage on Android. And you need to replace a new battery for your Android phone. Since your Android gets stuck in black screen and you can not perform your Android normally, you can rely on a professional recovery tool - Broken Android Data Extraction to help you recover text messages from your Android phone with ease. 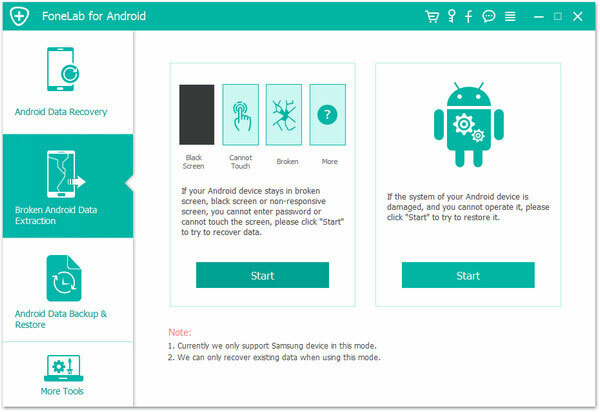 This program will automatically detect your device and scan your Android data without the need to enable USB debugging on Android phone. Also you can preview and select the files from your Android phone before recovering even though your Android phone gets stuck on any situation, such as Android stuck in black screen, Android stuck in boot screen, Android stuck in start screen and etc. And it is fully compatible with all Android phone, including Samsung, HTC, Motorola, LG, Sony, Huawei, ZTE, Google Nexus and etc. Now, please free download the program on your computer and help you recover SMS from Android phone with black screen with ease. Step 1. Run the program on your computer and link your Android phone to computer with USB cord, and the program will automatically detect your device. Then please choose "Broken Android Phone Data Extraction" on the left and click the first "Start" option to recover data from broken Android. Step 2. 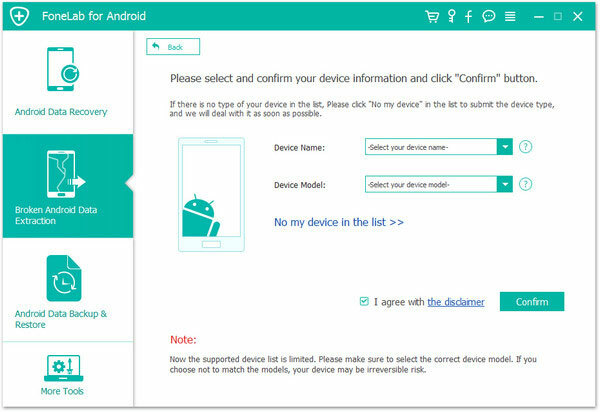 Then please choose the right device name and device model for your Android phone and click "Confirm" option. Step 3. 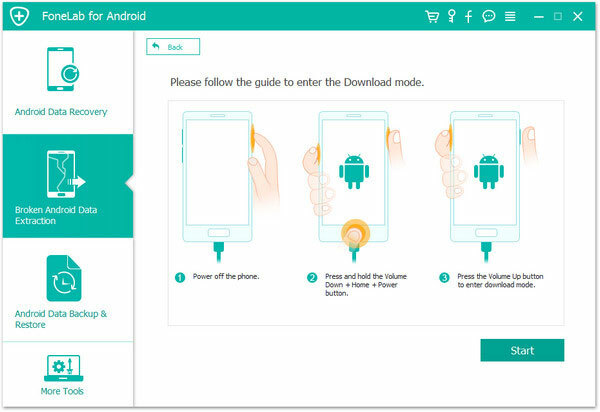 Then please follow the screen to put your Android phone into Download mode and then click "Start" button to move on. Step 4. After that, please check the box before the file types on the left for recovery, and click "Recover" button to save them on your computer immediately.